Nikolai Vasilievich Gogol (1809 - 1852) was a Russian short story writer, dramatist, and novelist born in the Cossack Village of Sorochyntsi, Ukraine. Part of the natural school of Russian literary Realism, Gogol later gained a reputation for his venture into the grotesque and surrealism, as in his short stories The Overcoat, The Nose, and Nevsky Prospekt. Gogol had a strong literary upbringing: he learned Ukrainian and Russian, his father wrote poetry and was an amateur playwright, and as a child Gogol helped stage his uncle's plays. He began writing while at a school of higher art in Nizhyn, where he earned the nickname "mysterious dwarf." He had a dark and secretive disposition, developed a talent for mimicry and satire, which eventually led to his exile from Russia. His satire was unconventional and much more sophisticated than his contemporaries. Gogol studied Ukrainian history, failed to gain a professorship at Kiev University, but in 1834, he was made Professor of Medieval History at the University of St. Petersburg. Completely unqualified for the post, Gogol missed his own lectures, and faked a toothache so he wouldn't have to interrogate his own students. He resigned in 1835 and began traveling through Germany, Switzerland, Paris, settling in Italy for twelve years where he studied art and opera, while mixing with Polish and Russian expatriates and exiles. Gogol was in touch with the literary "aristocracy" and considered one of the first masters of the short story, along with Edgar Allen Poe, Nathaniel Hawthorne, and Alexsander Pushkin. After Pushkin's death in 1839, Gogol reworked The Mysterious Portrait, and published the satirical epic, Dead Souls as well as his most famous story, The Overcoat. Gogol was considered a great satirist who exposed the unseemly sides of Imperial Russia. He intended to write a sequel to Dead Souls, as a modern-day take of The Divine Comedy, but in 1852 he burned some of his manuscripts by mistake, "a practical joke played on him by the Devil." Gogol, of questionable health already, took to bed, refused food, and died nine days later. 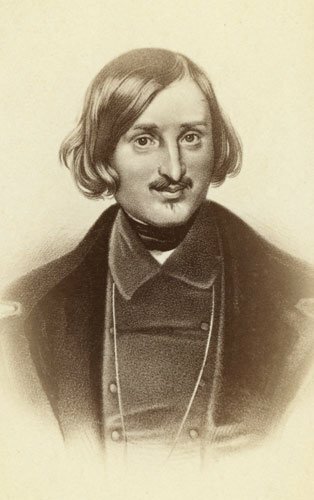 “Gogol, Nikolai Vassilievitch. Born in the government of Pultowa, March 31 (N.S. ), 1809, died at Moscow, March 4 (N.S. ), 1852. A Russian novelist and dramatist. He was educated in a public gymnasium at Pultowa, and subsequently in the lyceum, then newly established, at Niejinsk. In 1831 he was appointed teacher of history at the Patriotic Institution, a place which he exchanged in 1834 for the professorship of history in the University of St Petersburg. This he resigned at the end of a year and devoted himself entirely to literature. In 1836 Gogol left Russia. He lived most of the time in Rome. In 1837 he wrote ‘Dead Souls.’ In 1840 he went to Russia for a short period in order to superintend the publication of the first volume of ‘Dead Souls,’ and then returned to Italy. In 1846 he returned to Russia and fell into a state of fanatical mysticism. One of his last acts was to burn the manuscript of the concluding portion of ‘Dead Souls,’ which he considered harmful. He also wrote ‘The Mantle,’ ‘Evenings at the Farm,’ ‘St Petersburg Stories,’ ‘Taras Bulba,’ a tale of the Cossacks, ‘The Revizor,’ a comedy, etc.”—From The Century Cyclopædia of Names. Prosper Merimee also produced a fine sketch about Gogol which appeared as the preface of a collection of Gogol's stories.